Merle and Larry Schimke, Wessington Springs, repeat Ravine Creek Ranch bull buyers. 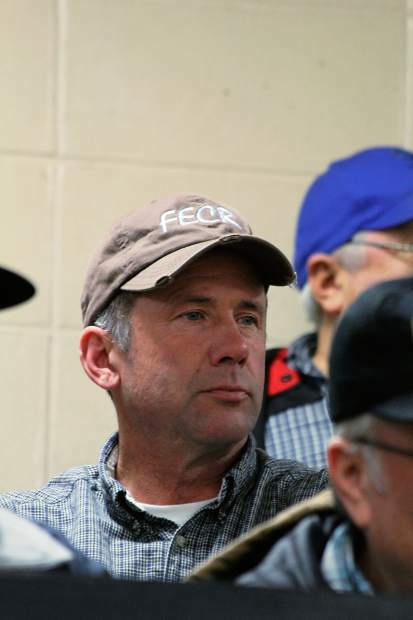 Keith Fawcett, Fawcettâs Elm Creek Ranch, Ree Heights, SD purchased the top bull at the Ravine Creek Ranch sale. 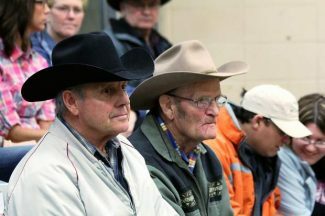 LeRoy Scott and Jim Schutte, Highmore SD take in the Ravine Creek Ranch sale. 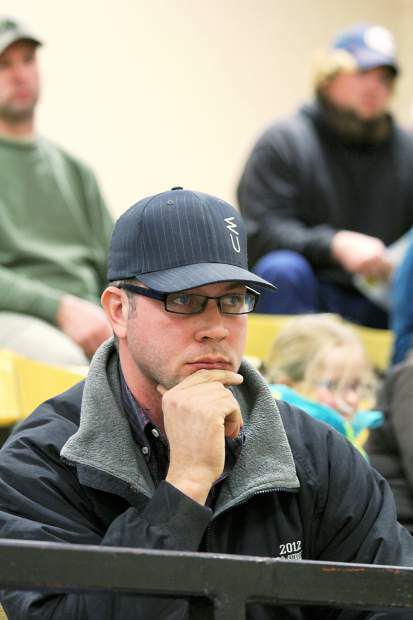 Schutte purchased several registered heifers. Steven Mueller, Agar, SD purchased to top selling registered heifer at the Ravine Creek Ranch 10th Annual production sale. Jerry and Janelle Bischoff and their families offered a great set of Polled Hereford bulls at their 10th annual Ravine Creek Ranch production sale. There were several herd sire prospects and a great selection of rancher bulls in the offering. 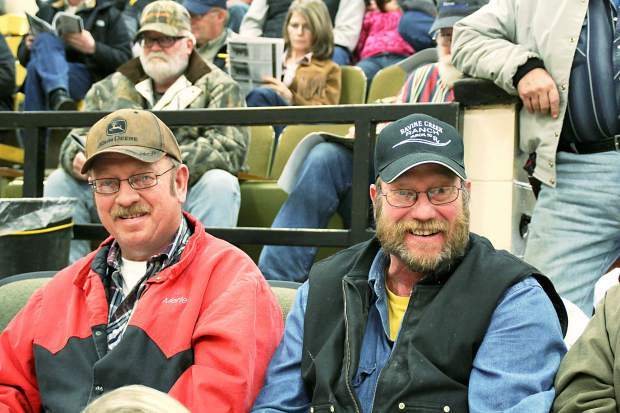 These bulls, and a great set of registered heifers and commercial baldy heifers were readily bid on by the large crowd of buyers on hand for the sale. Jerry has always expressed the need for stout, sound functional cattle that are ready to go to work. The bulls in the sale were in great condition to do just that. They had been fed to express their genetic potential, but not overly pushed. It was evident by the large crowd of repeat buyers that this bull will work. Topping the sale was lot 1, RV X51 Bennett 4921, an April 2014 son of KCF Bennett Revolution X51 and out of the K&B Lady Sentry 9021W donor cow. This bull had a weaning ratio of 115, yearling wt. of 1319 lb., and scanned a 15.46 ribeye. He has epds of BW 0.7 WW 66 YW 105 Milk 27 and sold to Fawcett Elm Creek Ranch, Ree Heights, SD for $27,000. Klages Polled Herefords, Ortonville, MN selected lot 5, RV Thunderstruck 4239 for $13,500. This Apr. 2014 bull has epds of BW 2.1 WW 58 YW 90 Milk 26 with a weaning ratio of 109, yearling wt. of 1254 lb. and scanned a 14.85 ribeye. Selling at $8250 was lot 7, RV Untapped 4034, an April 2014 son of C Bar 9161 Untapped 2267 that had a 121 weaning ratio, 1306 lb. yearling wt. and 15.73 ribeye. Stahly Ranch, Cavour, SD was the buyer. Lot 9, PF 719T Victor 4144, a Mar. 2014 son of TH 122 711 Victor 719T sold to Scott Katus, Watauga, SD for $8,000. This bull posted epds of BW 0.4 WW 61 YW 84 Milk 25. Lot 21, RV Limelight 4462ET, an April 2014 son of SHF Limelighter W18Y83 with epds of BW 3.1 WW 56 YW 92 Milk 24 sold to Matt Mohnen, White Lake, SD for $7750. Lot 3, a flush brother to the top selling lot 1 bull sold to Ollerich Bros., Clearfield, SD for $7500.